Judge Lehner, it should be emphasized, was not simply an ordinary American citizen. Besides being a judge presiding in New York City, he had been assigned to a case involving the 9/11 attacks in this city. So his ignorance about this building was surprising. And yet it was typical. With his query – “Building what?” – he expressed the ignorance manifested in 2006 by controlled demolition expert Danny Jowenko and almost half of the American people. How can we account for this ignorance? Moreover, when in 2008 NIST was accused of having deliberately delayed its report on WTC 7 (which the 9/11 Truth Movement had long considered the “Achilles Heel” or “Smoking Gun” of the official account of 9/11 ), NIST lied, saying that it had worked on this report only since 2005 and hence for only three years – the same length of time it had worked on its Twin Towers report. Actually, however, NIST had filed progress reports on WTC 7 in December 2002 and May 2003;28 in June 2004, it published an Interim Report on WTC 7;29 and in April 2005, NIST released another preliminary report on WTC 7.30 Then, after ceasing work on this building until after the report on the Twin Towers was issued in October 2005, NIST reported, “the investigation of the WTC 7 collapse resumed.”31 In truth, therefore, NIST had worked on its report on WTC 7 for almost six years, not merely three. So there was good reason to suspect that this report had been deliberately delayed for as long as possible. One type of fraud is falsification, which includes “omitting data.”34 While claiming that it “found no evidence of a . . . controlled demolition event,”35 NIST simply omitted an enormous amount of evidencefor that conclusion. Why this would be a miracle was explained by Chandler, who said: “Free fall can only be achieved if there is zero resistance to the motion.”62 In other words, the upper portion of Building 7 could have come down in free fall only if something had suddenly removed all the steel and concrete in the lower part of the building, which would have otherwise provided resistance. If everything had not been removed and the upper floors had come down in free fall anyway, even for only a second, a miracle – meaning a violation of laws of physics – would have happened. NIST’s admission that Building 7 came down in free fall for over two seconds should, therefore, have been front-page news. The same is true, moreover, of the various other things I have reported – NIST’s fabrications; NIST’s omission and distortion of testimonial evidence; NIST’s omissions of physical evidence, such as the Swiss-cheese steel and the particles showing that iron and molybdenum had been melted; and the later discovery of nanothermite particles in the WTC dust. Especially given the fact that the collapse of Building 7 had been declared a mystery from the outset, the world should have been waiting with baited breath for every new clue as to why this 47-story building had come down. 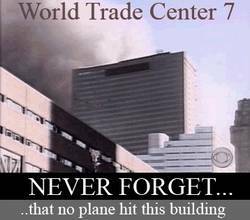 Upon hearing Building 7 mentioned, nobody in the world with access to CNN should have asked, “Building what?” How do we explain the fact that five and even nine years after the mysterious collapse of this building, ignorance about it was still widespread? 35 NIST NCSTAR 1-9, Structural Fire Response and Probable Collapse Sequence of World Trade Center Building 7, November 2008, Vol. 1 (http://wtc.nist.gov/NCSTAR1/PDF/NCSTAR%201-9%20Vol%201.pdf): 324. 41 Steven E. Jones et al., “Extremely High Temperatures during the World Trade Center Destruction,” Journal of 9/11 Studies, January 2008 (http://journalof911studies.com/articles/WTCHighTemp2.pdf): 8. 46 According to the Guide for Fire and Explosion Investigations, put out by the National Fire Protection Association, investigators should, in seeking to determine the cause of a fire, look for evidence of accelerants, which are any substances that could be used to ignite a fire or accelerate its progress (National Fire Protection Association’s 921 Guide for Fire and Explosion Investigations, 1998 Edition, Section 12-2.4 (http://www.interfire.org/res_file/92112m.asp), and thermite mixtures are explicitly classified as accelerants (Section 19.2.4, “Exotic Accelerants” and “Thermite Mixtures”). 60 David Chandler, “WTC7 in Freefall – No Longer Controversial,” September 4, 2008 (http://www.youtube.com/watch?v=rVCDpL4Ax7I), at 2:45. 69 Symposium on State Crimes Against Democracy, American Behavioral Scientist 53 (February 2010): 783-939 (http://abs.sagepub.com/content/vol53/issue6). Online access is expensive, but the entire issue can be purchased for $24 (journals@sagepub.com). 91 Jennifer Harper, “Explosive News,” Washington Times, February 22, 2010 (http://www.washingtontimes.com/news/2010/feb/22/inside-the-beltway-70128635/?feat=home_columns). This entry was posted in 911 and tagged 911 truth, crimes against humanity, david ray griffin, state crimes against democracy. Bookmark the permalink.